While the topic for today’s post is something that I touched upon in my recent guide to translating medical texts, I feel that it is something so engrained in the translation act that it is worth a more detailed exploration. In that post (under the sub-heading of ‘Poorly written texts’) I explained that technical texts are very frequently marred by the presence of many mistakes (typographical, stylistic, grammatical, formatting…) and here I want to further explore this feature of texts along with an array of weird and wonderful examples from a variety of sources in order to highlight the issues that they pose for the translator’s work. Examples of formatting and stylistic errors include the incorrectly placed space following the phrase ‘une alternative intéressant .’ (line 93), the unnecessary usage of a capital for ‘Plus de 77%…’ (line 61) as well as the inconsistent or unnecessary usage of full stops and commas in decimals, capitals for references to tables, and last but not least between using numerals or their full, written versions e.g. ‘Quatre enfants’ and ‘2 cas’ (lines 38 and 29 respectively). In addition to these examples, instances of typographical and grammatical errors include the misspellings of ‘haemophilus’ as ‘heamophilus’ (23), ‘aiguë’ as ‘aigue’ (64), ‘tétraventriculaires’ as ‘tétraventiculaires’ (80) and ‘hypertension’ as ‘hyperetension’ (figure 3) or the lack of agreement for ‘séries européenne(s)’ (55). Finally, the worst examples of errors must be the reference to table 6 on line 33 when there are only five tables and the usage of the non-existent ‘dérivation standard’ (table 4) – presumably a guess at the French version of the English term ‘standard deviation’ (which is actually ‘écart type’). This may seem like an extreme example yet the truth is that mistakes can and will happen in almost any kind of text (even in big budget Hollywood movies, as we will see) and the importance of taking the time and effort to proofread work cannot be overstated. Films obviously offer different challenges to written texts in the way that there are aesthetic and audio elements serving to complicate matters. For example, how could the translator go about dealing with this example from Aladdin? 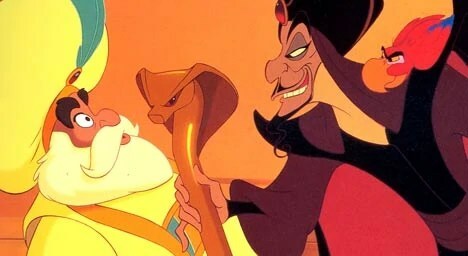 The animators clearly tried to make all the writing in the film look Arabic yet when we see the faces of Jafar and the Sultan reading a scroll, their eyes move from left to right (Arabic is read right to left). In this instance – when the translator has no control over the error – they must shift their focus to ensuring that they don’t introduce any new errors in their work, which can see the translation process turn into something resembling a game of chinese whispers as is the case with the error below. In this scene from French film Amélie (below, 0:28 onwards) where the death of Princess Diana is announced on the news, the narrator declares that the death occurred ‘dans la nuit du 30 août 1997′ [on the night of 30th August 1997] when it was in fact widely acknowledged to be the 31st August – a small detail, perhaps, but one which causes the translator/subtitler a bit of a problem. When a factual error such as this is found in a ST, the translator faces the dilemma of whether to remain faithful to their source and knowingly reproduce the error with the risk of it later being attributed to the translator themselves or whether to stray from the text and correct the error. In his excellent 2001 Revising and Editing for Translators, Brian Mossop suggests that ‘factual errors should be corrected if they seem to be inadvertent but not if they are important as author’s ignorance of the facts’ and, as the former appears to be the case here, the translator should presumably correct the error. However, in the English subtitle the translator not only neglects to change the date (perhaps it was not spotted or they deemed it unimportant) but also renders the French simply as ‘on August 30th 1997′ which, while seemingly only a small change, actually serves to compound the error (the night of the 30th and early hours of the 31st could perhaps be seen as nearly interchangeable, whereas this subtitle loses that margin for error). Facts and figures are an obvious place to find errors that can easily be overlooked as it is easy to assume that something is correct, yet it is always worth double checking. In his 2012 film Django Unchained – which toys with the traditional spaghetti western, known for playing fast and loose with history – Quentin Tarantino treats us to all kinds of historical inaccuracies and anachronisms (how about the use of dynamite years before its invention…). In the introduction we’re greeted with the subtitle ‘1858: Two Years Before The Civil War.’ when the war actually began in 1861. Yet here, despite the obvious errors, the translator’s task is more difficult than ever. Given Tarantino’s previous work (think Inglorious Basterds) it is actually quite likely that the mistakes are intentional and – rather counter-intuitively – the correct decision for the translator to take is to maintain the errors even when it is in their control to change them, as with the opening subtitle. Ultimately, it is important that the translator fulfils their extended role as proofreader and editor in both ensuring that mistakes present in the source text are spotted and that they don’t introduce more mistakes in their own work. This task is made slightly more manageable when working with written tasks due to the fact that the translator can often contact clients or authors to seek clarification on certain issues while the single-layered medium of writing (i.e. no contradictory visual or audio issues to contend with as in the examples above) reduces some of the burden. However, despite its importance, it remains an under-appreciated element of the translators task. As usual, a thought-provoking article. The best way to go about mistakes in the original text is to get in touch with the client and politely let them know and ask how to proceed. If the respective material has not been published yet (or sometimes even if it has), the mistake can be corrected and then the subsequent translation will mirror that. However, like you very well pointed out, sometimes it may not be possible – like films. I do tend to think that some mistakes have been introduced/left there intentionally. I mean, there are so many people involved in creating a film you would think factual mistakes would not go unnoticed. In this case, I think the translation should not actually correct the mistake. Yes, let the client know, but imagine the respective film is watched by someone familiar with both languages. An inconsistency between the original and the translation is likely to make them cringe or complain about the poor quality of the translation – regardless whether the rest of the film has been well translated, it’s easier to spot mistakes/inconsistencies and the like. Translate it as it is and let people complain to the author about having their facts wrong. Again, I am only referring to situations where nothing can be done about the original. Excellent points, all well made. There’s not really much I can add to that 🙂 Thanks for your comment Alina!